PAGASA Storm Signals 2015 - Manila Typhoon Center - Your online resource for typhoon updates. This page has been revised to reflect the new PAGASA Public Storm Warning Signals effective May 1, 2015 by virtue of Memorandum Circular No.3. The Philippine Atmospheric, Geophysical and Astronomical Services Administration is a Philippine national institution dedicated to provide flood and typhoon warnings, public weather forecasts and advisories, meteorological, astronomical, climatological, and other specialized information and services primarily for the protection of life and property and in support of economic, productivity and sustainable development. The government agency was created on December 8, 1972 by virtue of Presidential Decree No. 78 reorganizing the Philippine Weather Bureau into PAGASA. __The Philippine archipelago, which is surrounded by water, lies at the western rim of the Pacific Ocean, north of the equator and about a thousand kilometers from the Asian Mainland. It is bounded on the west by the South China Sea/West Philippine Sea, on the east by the Pacific Ocean, on the north by the Bashi Channel and on the south by the Sulu and Celebes Seas. It refers to the designated area in the northwestern Pacific where PAGASA is tasked to monitor tropical cyclone occurrences. Tropical Depression (TD) has maximum sustained winds of up to 61 kilometers per hour, equivalent to 33 nautical miles per hour or more. Tropical Storm (TS) packs 62 to 117 kilometers per hour. Meanwhile, a Severe Tropical Storm will only be applicable for the International Warning for Shipping, and will not be used for general public dissemination unlike the other categories. Typhoon (TY) is used in identifying a tropical cyclone with wind speeds 118 to 220 kilometers per hour or 64 to 120 knots. Super Typhoon (STY) has maximum sustained winds of more than 220 kilometers per hour. STY is as powerful as 120 nautical miles per hour or more. PAGASA employs a numbered warning system from 1 the lowest to 5 the highest depending on the wind speeds a locality is about to experience and the lead time before such conditions are to be experienced. When any Public Storm Warning Signal Number is hoisted or put in effect for the first time, the corresponding meteorological conditions are not yet prevailing over the locality. This is because the purpose of the signal is to warn the impending occurrence of the given meteorological conditions. The approximate lead time to expect the range of the wind speeds given for each signal number is valid only when the signal number is put in effect for the first time. Thus, the associated meteorological conditions are still expected in at least 36 hours when PSWS #1 is put in effect initially; in at least 24 hours with PSWS #2; in at least 18 hours with PSWS #3; and in at least 12 hours with PSWS #4 and #5. The lead time shortens correspondingly in the subsequent issues of the warning bulletin when the signal number remains in effect as the tropical cyclone comes closer. 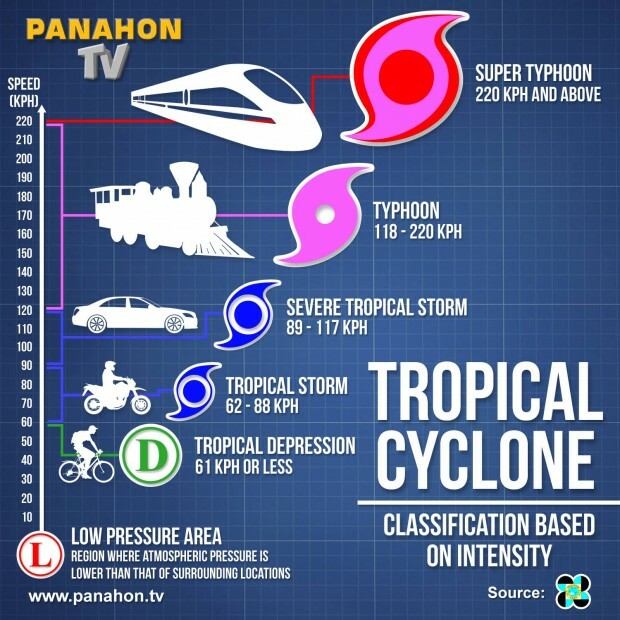 It is also important to remember that tropical cyclones are constantly in motion; generally towards the Philippines when PAGASA is issuing the warning. Therefore, the Public Storm Warning Signal Number over a threatened/ affected locality may be sequentially upgraded or downgraded. This means that PSWS #1 may be be upgraded to PSWS #2, then to PSWS #3 and to PSWS #4 as necessary when a very intense typhoon is approaching or downgraded when the typhoon is moving away. However, in case of rapid improvement of the weather condition due to the considerable weakening or acceleration of speed of movement of the tropical cyclone moving away from the country, the downgrading of signal may jump one signal level. For example, PSWS #3 may be downgraded to PSWS #1 or all signals from PSWS #2 may be lowered. The delineation of areas for a given signal number is based on the intensity, size of circulation and the forecast direction and speed of movement of the tropical storm or typhoon at the time of issue of the warning bulletin. The change in intensity, size of circulation or movement of the tropical cyclone also determines the change in the PSWS number over a given locality. _The initial warning to be raised once a Tropical Cyclone is to threaten a certain area. PSWS #1 is valid once the storm reaches Tropical Depression category. This warning notes that the winds may only very light or no damage at all may be sustained by the exposed communities, unless this warning signal is upgraded during the entire existence of the tropical cyclone. A tropical cyclone will threaten/affect an area. Winds of 30-60 kph is expected. When the tropical cyclone intensifies and moves closer, this warning signal number may be upgraded. The waves on coastal waters may gradually develop and swell. The people are advised to listen to the latest severe weather bulletin issued by PAGASA every six hours. Business may be carried out as usual except when floods occur. Disaster preparedness units are activated to alert status. Some banana plants may be tilted or uprooted. Rice crops in flowering stage may suffer significant damage. Minor damage to banana trees [Musa spp.] and near-coastal agriculture, primarily from salt spray. Some small dead limbs, ripe coconuts, and dead palm fronds blown from trees. Some fragile and tender green leaves blown from trees such as papaya [Carica papaya] and fleshly broad leaf plants. Some houses of very light materials may be partially unroofed. Only very light or no damage may be sustained by areas affected. Damage done to only the flimsiest lean-to type structures. Unsecured light signs blown down. On windward coasts, sea level rise of 2-4 ft (0.7-1.2 m) above normal in open bays and inlets due to storm surge and wind-driven waves. Breaking waves inside bays can reach 4-6 ft (1.2-1.8 m); 1-2 ft (0.3-0.7 m) of additional water over reefs. Very rough surf at reef margin with strong along-shore currents (rip tides) inside reefs. PSWS #2 is valid once the storm reaches Tropical Storm and/or Severe Tropical Storm category. This warning notes that the winds may bring light to moderate damage to the exposed communities. A tropical cyclone will affect an area. Winds of greater than 61 kph and up to 120 kph may be expected in at least 24 hours. The sea and coastal waters are dangerous to small sea craft. Special attention should be given to the latest position, direction and movement speed, and intensity of the storm as it moves toward an area. The public especially people traveling by sea and air are cautioned. Outdoor activities of children should be postponed. Secure properties before the signal is upgraded. Disaster preparedness agencies/organizations are in action to alert their communities. Some coconut trees may tilt; some of them may break. Rice and corn crops may be affected. 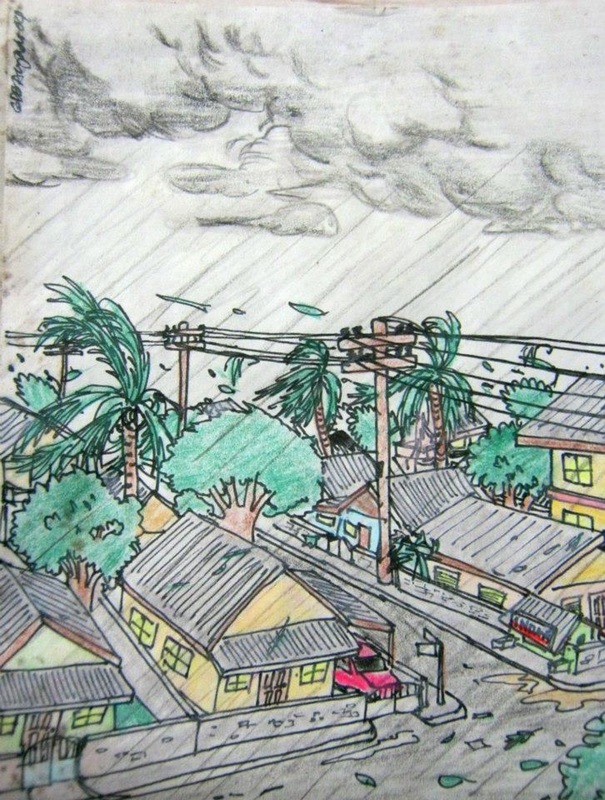 Moderate damage to banana trees, papaya trees, and most fleshy crops. Large dead limbs, ripe coconuts, nay dead palm fronds, some green leaves, and small branches are blown from tree. A large number of houses made of light materials may be unroofed. Old galvanized iron roofing may be peeled off. Major damage to huts made of thatch or loosely attached corrugated sheet metal or plywood. Unattached corrugated sheet metal and plywood may become airborne. Wooden signs not supported with guy wires are blown down. PSWS #3 is valid once the storm reaches Typhoon category. Warning roughly covers Category 1 and Category 2 typhoons on the Saffir-Simpson Scale. This warning notes that the winds may bring moderate to heavy damage may be experienced, particularly in the agricultural and industrial sectors. A Strong Typhoon will affect an area. Winds of greater than 121 kph up to 170 kph may be expected in at least 18 hours. The weather condition is dangerous to the communities affected. The sea and coastal waters will be very dangerous to all seacraft. Travel is very risky especially by air and sea. People are advised to seek shelter in strong buildings, evacuate low-lying areas, and stay away from the coasts and riverbanks. Watch out for the passage of the eye of the typhoon indicated by a sudden occurrence of fair weather immediately after very bad weather, with very strong winds coming generally from the north. 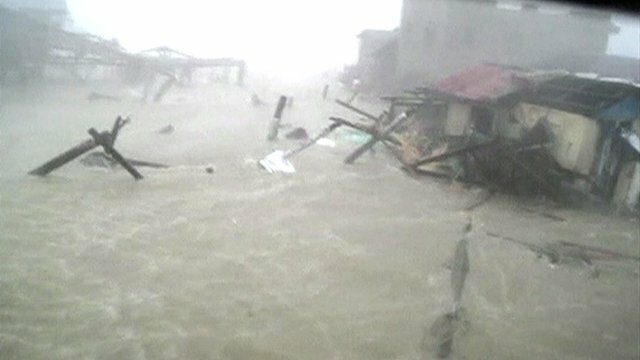 When the eye of the typhoon hits the community, do not venture away from the safe shelter because after one to two hours, the worst weather will resume, with the very strong winds coming from the south. Classes in all levels should be suspended and children should stay in the safety of strong buildings. Disaster preparedness and response agencies/organizations are in action with appropriate response to emergency. 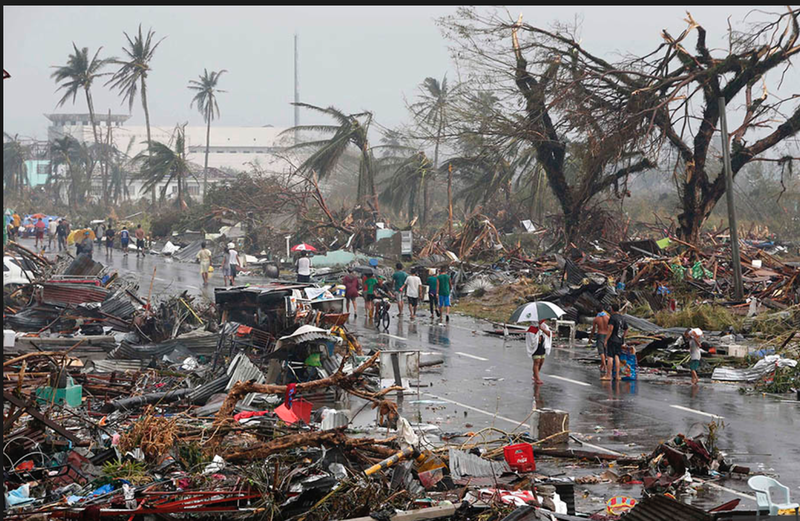 Major damage to banana trees, papaya trees, and fleshy crops. Some young trees downed when the ground is saturated. Some palm fronds crimped and bent back through the crown of coconut palms; A few palm fronds torn from the crowns of most types of palm trees; Many ripe coconuts blown from coconut palms. Less than 10% defoliation of shrubbery and trees; up to 10% defoliation of tagantangan. Some small tree limbs downed, especially from large bushy and frail trees such as mango, African tulip, Poinciana, etc. Exposed banana trees and papaya trees totally destroyed. 10-20% defoliation of trees and shrubbery. Light damage to sugar cane and bamboo. Many palm fronds crimped and bent through the crown of coconut palms and several green fronds ripped from palm trees. Some green coconuts blown from trees. 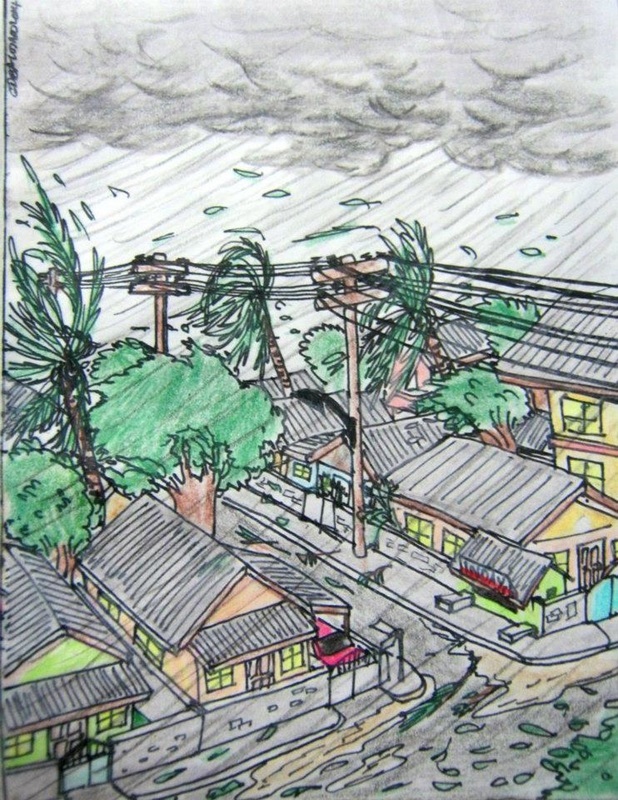 Some trees blown down, especially shallow rooted ones such as acacia, mango, and breadfruit when the ground becomes saturated. Majority of light material houses may be unroofed or destroyed. A few wooden, non-reinforced power poles tilted, and some rotten power poles broken. Corrugated metal and plywood stripped from poorly constructed or termite-infested structures and may become airborne. Well-constructed frame homes could have damage to roof, shingles, vinyl siding and gutters. Some damage to poorly constructed, loosely attached signs. Near-total power loss is expected with outages that could last from several days to weeks. Several rotten wooden power poles snapped and many non-reinforced wooden power poles tilted. Some secondary power lines downed. Damage to wooden and tin roofs, and doors and windows of termite-infested or rotted wooden structures, but no major damage to well-constructed wooden, sheet metal, or concrete buildings. Major damage to poorly constructed, attached signs. Considerable damage to structures made of light materials. Breaking waves inside bays can reach 5-7 ft (1.5-2.1 m) above normal; 2-3 ft (0.6-1.0 m) of additional water over reefs. Wind driven waves may inundate low-lying coastal roads where reefs are narrow. Some small craft in exposed anchorages break moorings. Breaking waves inside bays can reach 7-9 ft (2.1-2.7 m) above normal; 3-5 ft (1.0-1.5 m) of additional water over reefs. Wind-driven waves will inundate low-lying coastal roads below 4 ft (1.0 m) on windward locations where reefs are narrow. Some erosion of beach areas, some moderate pier damage, and some large boats torn from moorings. PSWS #4 is valid once the storm reaches Typhoon category. Warning roughly covers Category 3 and Category 4 typhoons on the Saffir-Simpson Scale. This warning notes that the winds may bring very heavy damage to affected communities. A Very Strong Typhoon will affect the area. Very strong winds of greater than 171 kph up to 220 kph may be expected in at least 12 hours. The situation is potentially very destructive to the community. All travels and outdoor activities should be cancelled. Evacuation to safer shelters should have been completed. The area is very likely to be hit directly by the eye of the typhoon. As the eye of the typhoon approaches, the weather will worsen continuously, with winds increasing to its strongest coming generally from the north. A sudden improvement of the weather with light winds will be experienced, which means the area is under the eye of the typhoon. Depending on the eye’s diameter and movement speed, this improved weather may last for an hour or two. As the eye moves out of the area, weather conditions will worsen, with strong winds generally coming from the south. The disaster coordinating councils concerned and other disaster response organizations are now fully responding to emergencies. Coconut plantations may suffer extensive damage. Numerous ripe and many green coconuts blown off coconut palms; crowns blown from a few palm trees. Moderate damage to sugar cane and bamboo. Some very exposed panax, tangantangan, and oleander bent over. Shrubs and trees 50-90% defoliate; up to 100% of tangantangan defoliated. Up to 75% of palm fronds bent, twisted, or blown off; many crowns stripped from palm trees. Numerous green and virtually all ripe coconuts blown from trees. Severe damage to sugar cane and bamboo. Many large trees blown down -- palms, breadfruit, monkeypod, mango, acacia, and Australian pine. Considerable bark and some pulp removed from trees; most standing trees are void of all but the largest branches (severely pruned), with remaining branches stubby in appearance; numerous trunks and branches are sandblasted. Patches of panax, tangantangan, and oleander are flattened. Well-built framed homes may incur major damage or removal of roof decking and gable ends. 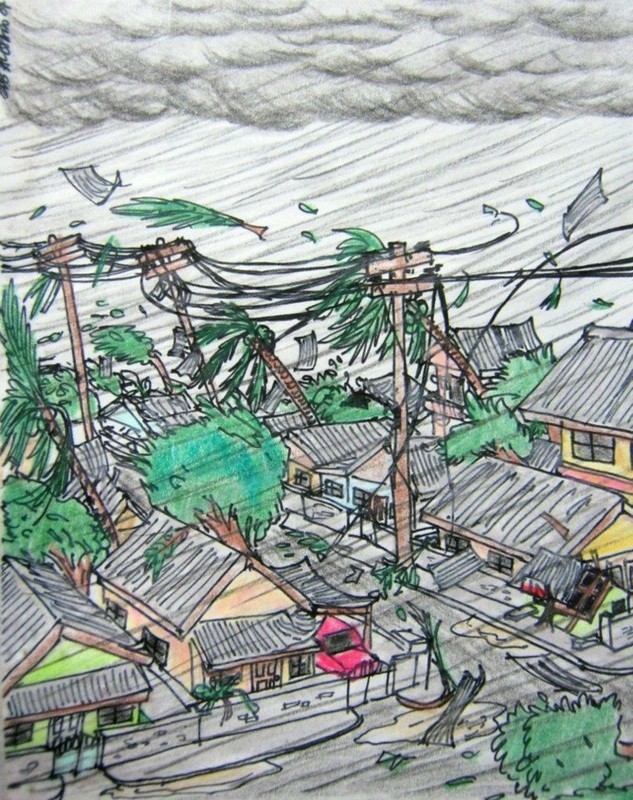 A few non-reinforced hollow-spun concrete power poles broken or tilted and may non-reinforced wooden power poles broken or blown down; many secondary power lines downed. Practically all poorly constructed signs blown down and some stand-alone steel-framed signs bent over. Some roof, window, and door damage to well-built, wooden and metal residences and utility buildings. Extensive damage to wooden structures weakened by termite infestation, wet-and-dry wood rot, and corroded roof straps (hurricane clips). Non-reinforced cinderblock walls blown down. Many mobile homes and buildings made of light materials destroyed. Some glass failure due to flying debris, but only minimal glass failure due to pressure forces associated with extreme gusts. Some unsecured construction cranes blown down. Air is full of light projectiles and debris. Well-built framed homes can sustain severe damage with loss of most of the roof structure and/or some exterior walls. Power outages will last weeks to possibly months. Most of the area will be uninhabitable for weeks or months. 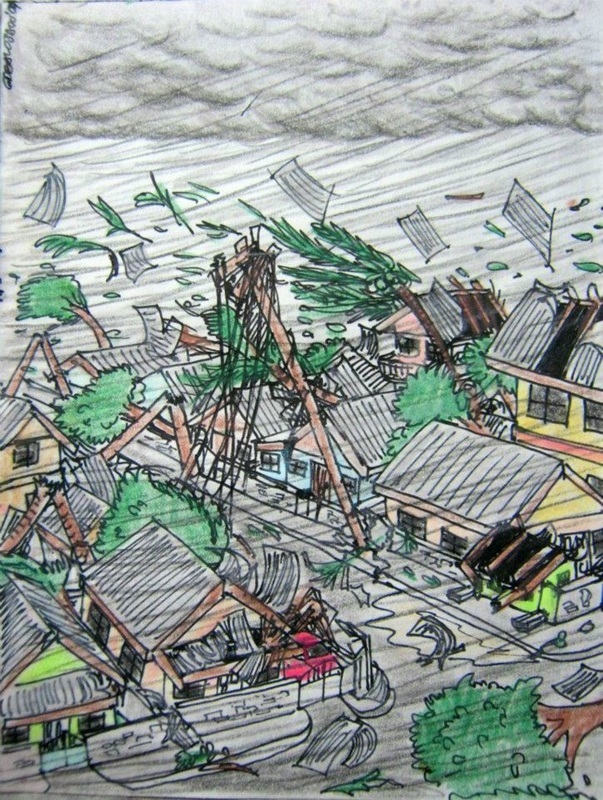 Some reinforced hollow-spun concrete and many reinforced wooden power poles blown down; numerous secondary and a few primary power lines downed. Extensive damage to non-concrete roofs; complete failure of many roof structures, window frames and doors, especially unprotected, non-reinforced ones; many well-built wooden and metal structures severely damaged or destroyed. Considerable glass failures due to flying debris and explosive pressure forces created by extreme wind gusts. Weakly reinforced cinderblock walls blown down. Complete disintegration of mobile homes and other structures of lighter materials not tied down. Most small and medium-sized steel-framed signs bent over of blown down. Some secured construction cranes and gantry cranes blown down. Some fuel storage tanks may rupture. Air is full of large projectiles and debris. Breaking waves inside bays can reach 11-14 ft (3.3-4.2 m) above normal, 5-7 ft (1.5-2.1 m) of additional water across reefs. Wind-driven waves will inundate low-lying coastal roads below 7 ft (2.1 m) of elevation on windward locations where reefs are narrow. Many large boats and some large ships torn from moorings. Breaking waves inside bays can reach 15-24 ft (4.5-7.3 m) above normal; 8-12 ft (2.4-3.7 m) of additional water over reefs. Wind-driven waves will inundate coastal areas below 12 ft (3.7 m) elevation. Large boulders carried inland with waves. Severe damage to port facilities including some loading derricks and gantry cranes. Most ships torn from moorings. The highest warning, PSWS #5 is valid once the storm reaches Super Typhoon category. Warning roughly covers Category 5 typhoons on the Saffir-Simpson Scale. This warning notes that the winds may bring widespread and devastating damage to affected communities. An Intense, Super Typhoon will affect the area. Intense winds of more than 220 kph may be expected in at least 12 hours. The situation is potentially extremely destructive or catastrophic to the community. Evacuation to safer shelters should have been completed since it may have been too late for this situation. This improved weather may last for one to two hours depending on the diameter of the eye and the speed of movement. As the eye moves out of the locality, the worst weather experienced before the lull will suddenly commence. This time the very strong winds will come generally from the south. Total damage to banana plantation. Most tall trees are broken, uprooted, or defoliated. Coconut trees are stooped, broken, or uprooted. Few plants and trees survive. Shrubs and trees up to 100% defoliated; numerous large trees blown down. Up to 100% of palm fronds bent, twisted, or blown off; numerous crowns blown from palm trees; virtually all coconuts blown from trees. Most bark and considerable pulp removed from trees. Most standing trees are void of all but the largest branches, which are very stubby in appearance and severely sandblasted. Almost total damage to structures of light materials, especially in highly exposed coastal areas. Complete roof failure on many buildings. Total failure of non-concrete reinforced roofs. Extensive glass failure due to impact of flying debris and explosive pressure forces during extreme gusts. Extensive or total destruction to non-concrete residences and industrial buildings. Some structural damage to concrete structures, especially from large debris, such as cars, large appliances, etc. Severe damage to some solid concrete power poles, to numerous reinforced hollow-spun concrete power poles, to many steel towers, and to virtually all wooden poles; all secondary power lines and most primary power lines downed. Power outages will last for weeks to possibly months. Many well-constructed storm shutters ripped from structures. Some fuel storage tanks rupture. Nearly all construction cranes blown down. Air full of very large and heavy projectiles and debris. Breaking waves inside bays can be > 30 ft 99.2 m) above normal; 12-18 ft (3.7-5.5 m) of additional water over reefs. Serious inundation likely for windward coastal areas below 18 ft (5.5m) elevation. Very large boulders carried inland with waves. Extensive damage to port facilities including most loading derricks, gantry cranes, and fuel piers. Virtually all ships, regardless of size, torn from moorings and many sunk.